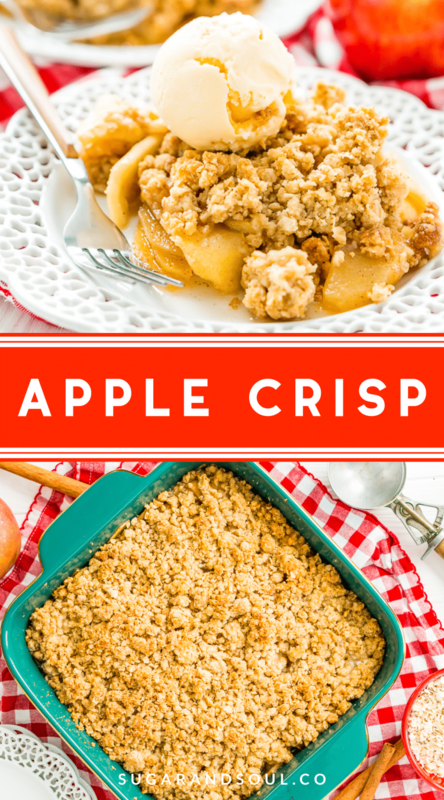 Apple Crisp is a classic dessert recipe that’s perfect for summer and fall. Tender and spicy apples are topped with a sweet and crisp oatmeal topping. Although apple picking season is still a few months away, it’s never a bad time to enjoy a crumby, ice cream-topped square of Apple Crisp, amirite? 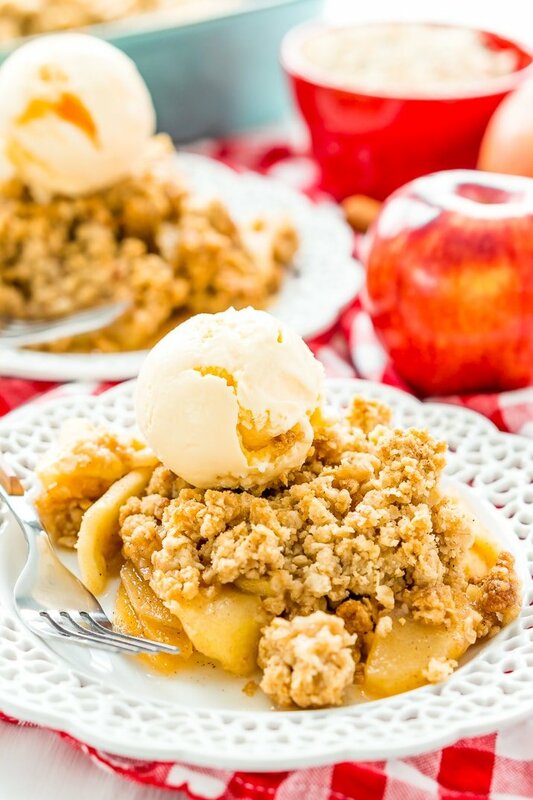 As a matter of fact, I love making Apple Crisp all year round, even in the summer! For one, this fruit-filled dessert doesn’t sit too heavy, and topped with a scoop of ice cream — or eaten straight from the fridge — it’s irresistibly delicious, even on a warm day. Second, this nostalgic dessert is super easy to make and share with all your friends and family. And third, whoever said you could only enjoy this spice-filled treat at a certain time of year? JUST TAKE ME TO THE APPLE CRISP RECIPE ALREADY! 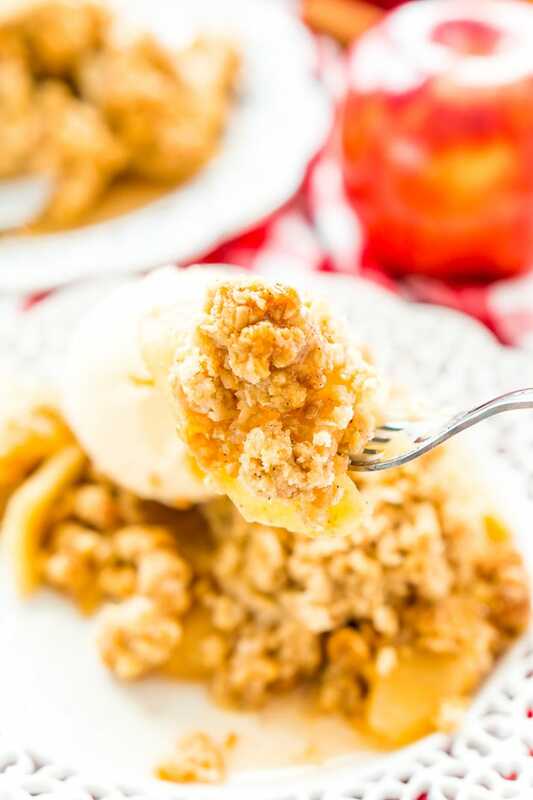 If you’d rather skip my (very helpful, I think) tips and tricks, essential cooking info, and similar recipe ideas – and get straight to this deliciously easy Best Ever APPLE CRISP Recipe – simply scroll to the bottom of the page where you can find the printable recipe card. 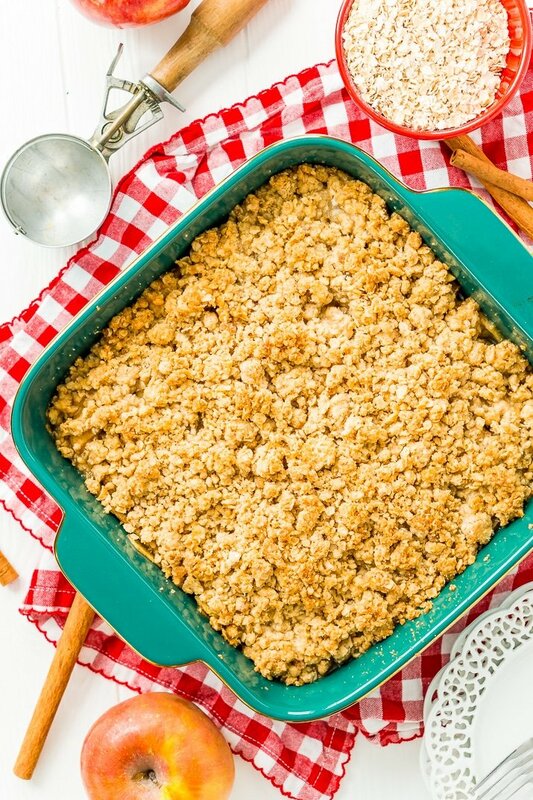 Is Apple Crisp the same as Apple Crumble? A crumble which is a common dessert in the UK is apples baked with a topping of flour, butter, and sugar. In North America, we have crisp which is basically the same thing, but the topping is made primarily with rolled oats rather than flour. It’s also almost always made with cinnamon and sometimes nuts are added to it as well. Crisps and crumbles are pretty much the same but technically the topping on a crisp is supposed to be a bit finer so it’s crunchier. What Are the Best Apples to use in an Apple Crisp? This might be the most important question to ask when making this recipe, honestly, though, it comes down to personal preference, but here are my top recommendations for this recipe! In this easy dessert recipe, the apples are baked with butter, sugar, and spices to create the luscious bottom layer. The topping, which combines oatmeal and flour with butter, sugar, and cinnamon, creates a crumbly top layer that turns golden brown in the oven. That buttery, brown sugar-laced topping is what makes Apple Crisp totally irresistible. While there are a lot of versions out there, I prefer this recipe because it includes oatmeal, making the crumble dense and hearty. 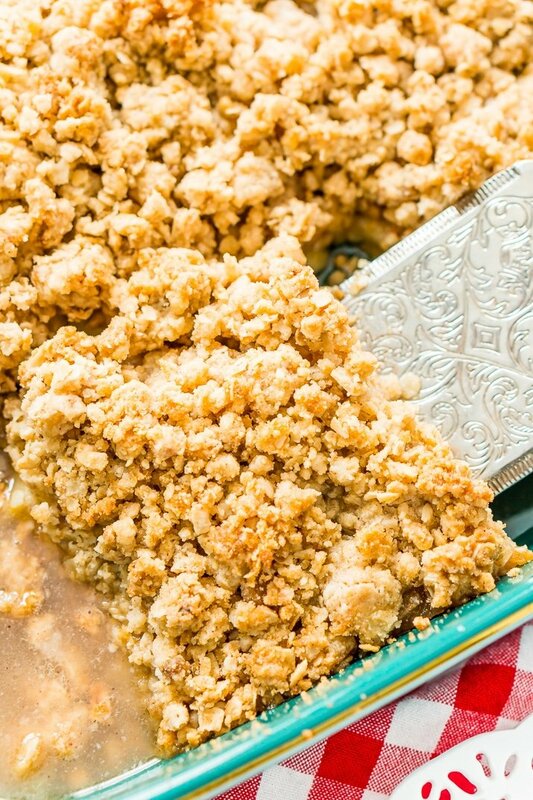 Do you have to keep Apple Crisp in the fridge? Yes and no. When it first comes out of the oven, it should be left on the counter to come to room temperature, although you can indulge right away if you’d like (those apples will be very hot though)! Once it comes to room temperature, it can usually stay there for the day but should be refrigerated overnight. This is one of those simple recipes that’s great to make with the helping hands of kids, especially on a rainy day or if they’re bored by the second week of summer vacation! Most of the prep is just mixing up the apple mixture and crumble topping before combining them in a pan, although the apple peeling and slicing can be left to the adults. The most time-consuming part of this recipe is the 35-40 minute bake time, so you can catch up on your favorite show as the spiced apple aroma starts to fill the house! 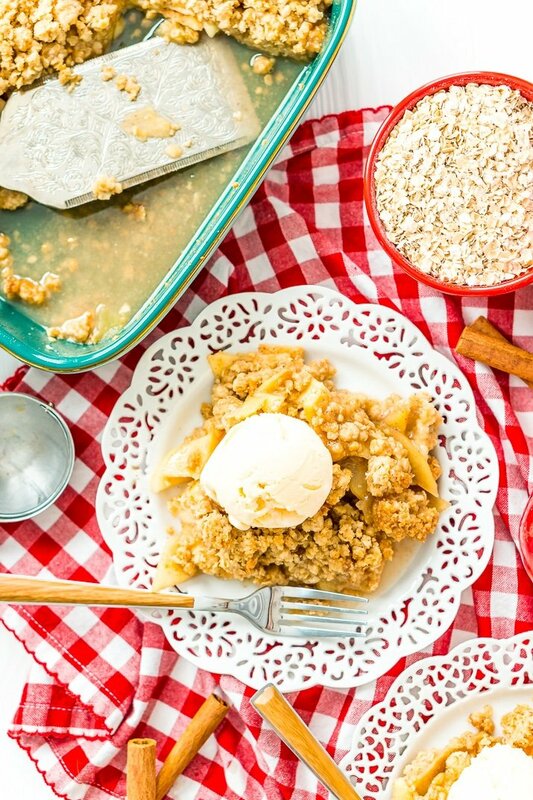 If you’re hosting or attending a Fourth of July barbecue, consider making a couple batches of Apple Crisp to share. Everyone loves a tried-and-true classic, plus it’s hard to mess up this easy dessert! Don’t wait until fall — this simple recipe can be made and enjoyed during any season! It’s cozy in the cooler months but served with a scoop of ice cream, you can cool it down and enjoy it all summer long. 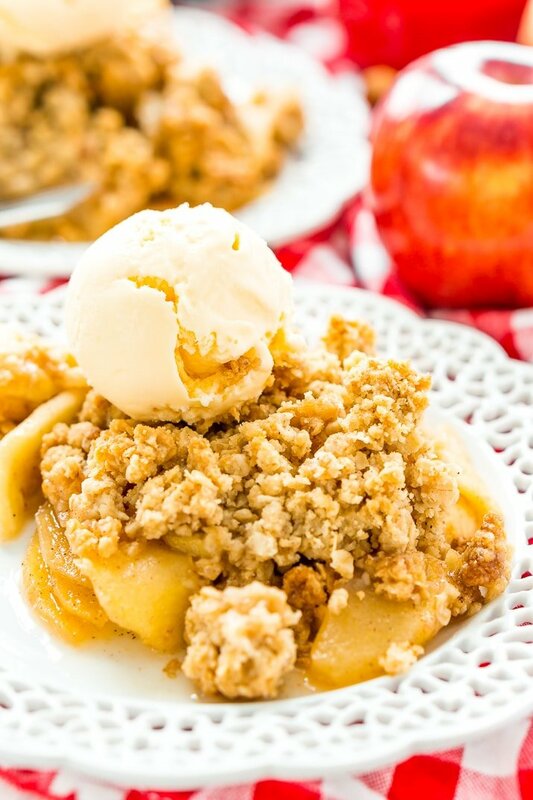 Apple Crisp is a classic dessert recipe that's perfect for summer and fall. Tender and spicy apples are topped with a sweet and crisp oatmeal topping. Stir together apple mixture ingredients in a large bowl and pour into a greased 9x9-inch baking dish. Mix together the topping ingredients until a thick crumble forms. Spoon out over the apple mixture and gently press to cover. Remove from oven and serve warm or at room temperature with ice cream and whip cream, if desired. You can slice your apples as thick or thin as you want, I prefer to slice mine into tenths. This is my ALL TIME favorite dessert! They crunchy crust, amazing flavors and the contrast of the hot apple crisp with the cold vanilla ice cream is all perfection! Loving it with honeycrisp apples – so good! Thanks for the fantastic recipe!